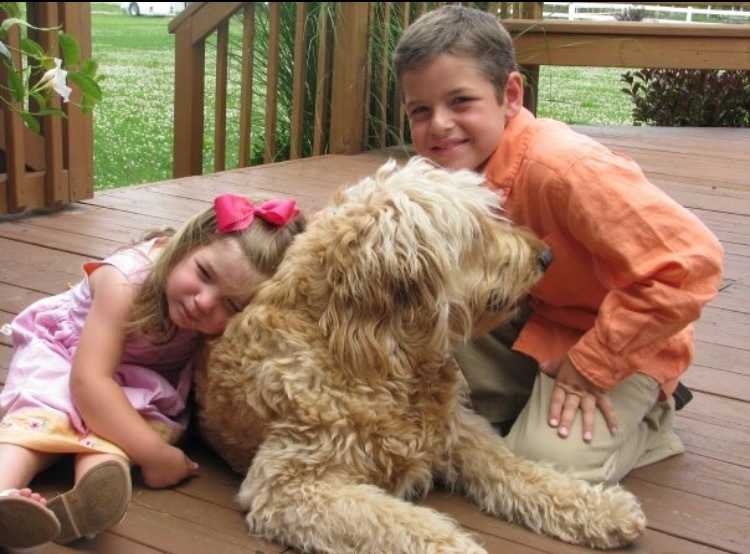 Best Doodle Puppy is part of Almost Paradise Farm, a 100 acre family farm located in East Central Indiana. We are conveniently located just 30 miles northeast of Indianapolis. Our name says it all as we enjoy living, working and raising our family while stewarding the land and livestock God has blessed us with. We hope you enjoy this visual tour of Almost Paradise Farm. FAMILY- Almost Paradise Farm has 3 generations of family currently working the farm. We are blessed to have over 80 yrs of combined experience in animal husbandry and land management. We count it a privilege to raise our family in this setting. We have 6 children and they are all involved in the daily operations of the farm to one extent or another. We are also very involved in our community, as well as in our church. In their spare time, our children enjoy volleyball, basketball and music. Our 2 oldest daughters have had the awesome privilege of performing at the Govenor’s residence for Indiana Gov. Mike Pence and his wife. Whether they are moving cows, driving the tractor, or performing on their violins for the governor of the great State of Indiana, each day is a privilege and a gift from God. 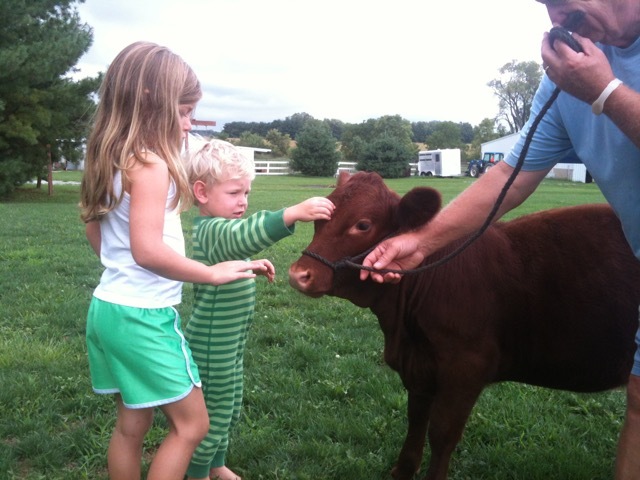 FARM- We currently raise grassed beef, pasture raised meat chickens, miniature donkeys and doodles. 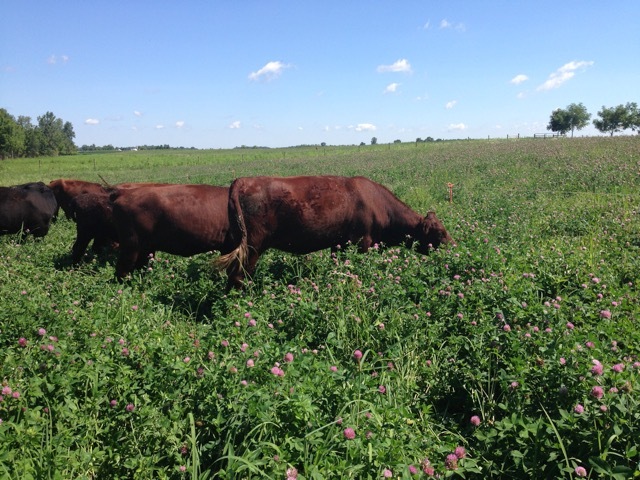 Our grass fed beef are rotationally grazed, also called managed intensive grazing. This means that every day they are moved to a fresh plot of grass, enabling the cows to eat and then fertilize the area before moving on. That area is then rested for a period of time to allow regrowth. This provides great benefits for the land as well as the beef cows. We chose to focus our herd with American Red Devon cattle. They are known as “supreme beef on grass.” The history of Red Devon Cattle goes all the way back to the Pilgrims, who brought the first Devons to America in 1623. Their docile temperament and smaller frame makes them an easy choice for rotational grazing. We sell our beef by the half or whole. Contact us for more information or to be put on our waiting list. The chickens are cornish cross meat birds that are pasture raised. This means they live outside breathing fresh air, eating green grass and bugs in the safety of our “chicken tractors” that are moved to a fresh spot of our pastures every day. The miniature donkeys are raised for breeding stock, show, or just pets for the hobby farmer. We specialize in true black & white spotted miniature donkeys. Our donkeys are very friendly and lovable and enjoy helping us with “weed control” in the pastures. Our donkeys are literally all over the world as we have sold to many farms here in the U.S. and also Canada and Australia. The doodles are a part of our family farm that we all love. The passion started 14 years ago with our goldendoodle Molly. Molly has plenty of help on the farm with the younger doodles Chloe, Maggie and Ruby. Click on our gallery link at the bottom of the page to see additional photos.